The names are familiar: Buena Vista, Vera Cruz, Monterrey, Chapultepec. Zachary Taylor, Winfield Scott, Santa Anna, Jefferson Davis, Robert E. Lee. But the war may not be. The Mexican-American War, 1846-1848, was one of the most important events in American history, giving the United States ownership of what would become New Mexico, Arizona, Colorado, Nevada, and California, opening them up for American settlement but also setting the stage for the American Civil War over the question of whether those new territories would be Free or Slave states. It served as the training ground for many future Civil War generals- Davis, Lee, Braxton Bragg, Ulysses Grant, and Thomas Jackson, to name just a few. Winfield Scott's landing at Vera Cruz and march on Mexico City was regarded at the time as one of the greatest feats of generalship ever conducted. Yet wargames about the Mexican-American War are very rare, and it's about time we saw a new game on the subject. The Halls of Montezuma is a card driven design from David Fox and Michael Welker, bringing a strategic and operational look at the American war with Mexico, tracing the war's history from the opening battles along the Rio Grande to the U.S. invasion of Vera Cruz and the occupation of Mexico City by the future American Civil War leader, Winfield Scott. 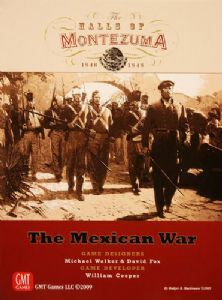 The Halls of Montezuma (HoM) is a card-driven game that rests on the lower end of the GMT game complexity meter, while still capturing all the tension, uncertainty, and chaos of the conflict. The American player is cast in the role of President Polk, dealing with a reluctant Congress and an army with excellent commanders but few professional troops. The Mexican player takes on the unique role of handling an unstable central government dependent on the popular and patriotic but volatile Antonio López de Santa Anna (who begins the game in exile). Military forces maneuver throughout parts of Mexico, Texas, and territory that would become the southwestern border region of the expansionary United States, depicted on a point-to-point map of the theater of war. As with the other card driven games (CDG's) players must organize their overall aims using a shared deck of strategy cards that regulate military campaigns, political and economic forces, and a range of special events that can become the basis of victory or defeat. The focus of HoM is on the political will of the Mexican government which seeks quick military successes and conquest of the recently annexed territory of Texas, thus bringing the American Congress to a negotiated end of the conflict. The American player, on the other hand, attains victory by reaching game results that are equal to or greater than the historical outcome. The Mexican-American War was a war of great contrasts, offering the gamer attractive and unusual options. The United States can conduct a protracted ground war or attempt a naval strangulation of the Mexican economy. Mexico can mass large armies or spread its forces for varied probing attacks that exploit American weaknesses. Combat in HoM uses a combination of doctrine, weapon systems, leadership, terrain, and other factors along with a randomized intensity level which allows the game to cover everything from small border skirmishes to full-scale pitched battles. Special rules provide a flavor for this unusual war by adding, among other things, local revolts, the often harsh Mexican climate, Indian raids, Guerilla bands, the founding of the Bear Flag Republic under John C. Fremont, the overwhelming personality of Santa Anna, and even the desperate American need for accurate maps of Mexico. HoM offers a single campaign scenario playable in two to three hours, given sudden death victory conditions. This makes the game ideal for an evening of friendly play as well as for tournaments and play-by-email. If you enjoy the other CDG's, HoM brings you the Mexican-American War in a format that hearkens to the design elegance and playing time of We The People ™, the ground-breaking game by Mark Herman. HoM uses mechanics and cards to capture the excitement, tension, and uncertainty of this rarely simulated conflict from American history, the war that was a training ground for so many generals who would become fierce enemies in a later conflict. Can Mexico emerge as a new North American power or will the United States fulfill its Manifest Destiny?